Memorial services for my Uncle Willard Benner at Vincent Mennonite Church, Spring City, Pa., marks the end of an era—the last of a generation of Benner brothers—all five of them, including my father, Paul. It also conjures up lots of good memories of the large Dutch gable patriarchal house on 240 Chestnut St., Souderton. 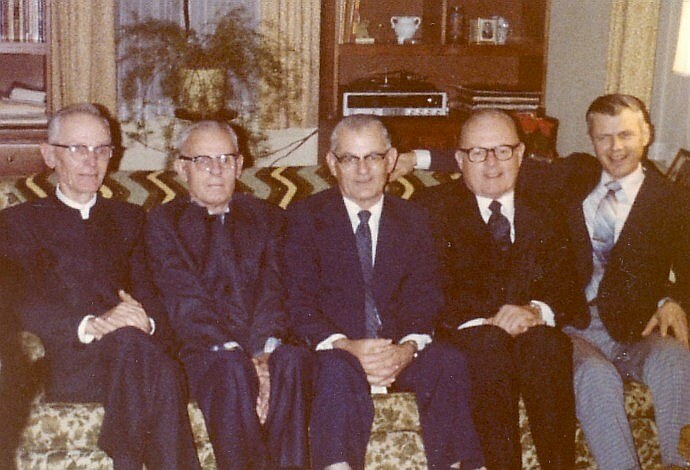 These are the “men” of my childhood, in order, Paul, my father the eldest, followed by uncles Edwin, Marvin, Merrill and Willard—all good-looking, slender types, all hard-working blue collar, all a little resentful of the lifestyle and demands of their bourgeois bosses, the Fenstermakers of Granite Hosiery Mill where they all, except Edwin, labored, in not a badly paid craft. Oh my, the grumble sessions at Sunday gatherings; you would have thought they were all indentured serfs living under the merciless demands of the landed gentry. The griping was offset, though, with the good and often loud humor of Uncle Merrill, who insisted we had “Indian blood” in our veins, making all of the men “hunters” and the women the “gatherers.” My father would roll his eyes and grin; Uncle Marvin would always laugh it off and Uncle Willard, the youngest, was enamoured with the dramatic connection, even though it was more legend than genealogy. Uncle Eddie, a little mentally challenged, thought it a silly joke, but joined the laughter to keep the peace. But I was young, happy and far removed from the din of the workplace, so what stands out for me were the happy times—the joys of hunting season, complete with the baying of the beagles as they rounded up the rabbits in the fields, the large garden and grapevines of the big yard leading out to the garage, the swing set under the cherry tree. And oh, those ground cherry pies. And rabbit pie. Yum! If you could escape from the stories of drudgery in the living room, where the uncles gathered, you could always go to the parlor in the front of the house where the ornate piano with pedals would accompany the familiar hymns as we gathered round in wonderful four-part harmony. I enjoyed the family stories my Dad would tell about how, in leaner times, the food had to be carefully divided so that each in this large family would get enough. The boys would count the thumb indentures of the pie crust so that each one got exactly the same; Uncle Eddie would hide his piece under the table till everyone had consumed theirs, then bring it up to his plate and deliciously and loudly smack his lips while the others looked hungrily on—hugely annoyed with his antics. Uncle Willard was only a year older than my brother, Ernest, who, had he lived beyond his 14 years, would now be 79, as Beatie has noted. I never really thought of Willard as an uncle, but more as an older brother. He was quiet, but really, really smart, having perhaps the most scientific brain of the bunch, capable of some type of engineering had he the opportunity and self-confidence to pursue such a career. While I don’t know the details of his romance, he must have made an important connection with our family living in Spring City because he found the love of his life in Marjorie Bechtel, from one of the reputable and accomplished families of our church community. And when he served his 1-W service in Brattleboro, Vermont, I thought he was the “coolest” uncle on earth. His handwriting, always a standout in the family “circle letter,” was signature Benner calligraphy; his eye for beauty and the inspiration of nature captivating you from his camera lens. His was more than amateur photography; it was a work of art. In fact, he was gardener, artist, photographer, part engineer and scientist all wrapped up in one. But you would never know it because he would never draw attention to himself. An introvert, of course, he always deferred to those considered better and more talented than himself, but he was way too modest. He seemed to suffer, far too much, from a poor self-image when he could have asserted himself as a multi-talented person—beyond his more aggressive peers. May he rest in peace and in the arms of a loving Creator who gave him 80 good years of faith and family. And may his passing mark the end of an era of the good and productive lives of the five sons of Charles and Leanna Benner. Thanks for a wonderful tribute to Uncle Willard and the Benner men! May they all rest in peace and may we all live our lives with as much integrity did.